Famous for its hauntingly beautiful lament – “When I am laid in earth” – Purcell’s Dido & Aeneas is one of the earliest English operas. Alongside our sold-out performance at Town Hall, Birmingham last February, the talented young singers of our Academy of Vocal Music have been learning the opera – in the spirit of the first known performance at Josiah Priest’s girl’s school in Chelsea in the late 1680’s. Conducted by Jeffrey Skidmore, members of our Academy of Vocal Music will be joined by pupils from King Edward VI School, Stratford and by instrumentalists from Birmingham Conservatoire. And in the second half of the concert the younger members of our Academy, from the Children’s Academy and Junior Academy, will perform a range of songs that they have learnt during the year. 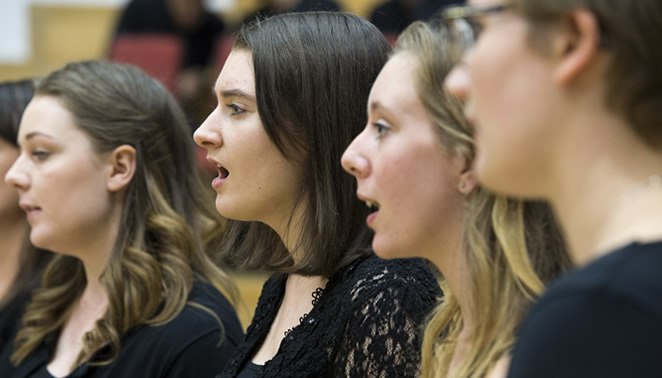 Ex Cathedra’s Academy of Vocal Music provides exciting opportunities for the region’s best 4-18 year-old singers. It is overseen by Jeffrey Skidmore OBE, Artistic Director, and led by members of our education team: Rebecca Ledgard, Director of Education; Suzzie Vango, Girl’s Academy Conductor, Rob Challinor, Principle Accompanist; and Sally Spencer Children’s Academy Leader. We provide a variety of training and performing opportunities including with Ex Cathedra itself, conducted by Jeffrey Skidmore, as well as performances for other partners including Birmingham Royal Ballet’s annual Nutcracker at Birmingham Hippodrome. The concert is free to attend but tickets are limited, please book via the link above. There will be a retiring collection, with funds raised being used to support the Academy of Vocal Music’s future events. Madelaine Barber Fray, Scarlett Brunning, Charis Burden, Emily Evans, Rosy Heneghan, Bronagh Lee, Graham Maclean, Oliver Maclean, Manon Rabier, Hope Rodenhurst, Olivia Skellern, Zoha Sohail, Hannah Tatman, and members of King Edward VI School, Stratford.